As you join me today we have just a few weeks left until our first family trip to DLP and Tinks first visit to see The Mouse. We have made a Countdown wall chart to tick off the last 16 days which Tink helped to make by covering in Tinkerbell and Pooh Bear stickers. We have been watching films to get in the mood, Tangled, Toy Story 3 and Finding Nemo seem to be firm favourites at the moment. We have also been looking at rides, attractions and shows on YouTube, it's funny to watch her face when they start singing in French, she looks most bemused. Tink is only 2 years and 5 months, so she knows that at some point we are going to see Mickey, but she is just not sure when. It is also confusing for her when we talk about DLP and WDW. She understands that we have to travel to see Mickey, but is not sure why sometimes we mention going on a train (the Euro Tunnel) or sometimes a plane. But she'll get it all one day. 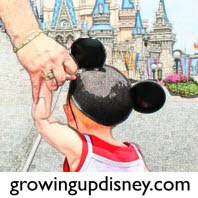 It's not every 2 year old that gets to go to 2 different Disney Parks in one year! I've started washing and packing the holiday clothes. We've bought several new items of clothing for this trip including some Disney tee-shirts for all of us. We've all ot new shorts too and Tink has new shoes, sandals and a waterproof jacket. I've been collecting stickers and crayoning books to keep her entertained on the journey, and she has some new books and an electronic game as a surprise too. It's not as long a travel day as when we fly to FL but it'll be a good 4 to 5 hours in the car which is more than enough for a toddler. I'm planning to load up the iPad with some more Mickey and Manny too, if it doesn't get used on the journey it'll definately get used in the farm house later on. We've made a decision to skip the hotel breakfast and make to most of EMH by getting straight to the Park and grabbing a coffee and cake to-go from one of the bakeries instead. This suits us as we don't need to bet Tink up too early (France is an hour in front of the UK) and she isn't a breakfast person anyway. She'll be happy with some milk or juice and a pastry in the Park. We plan to meet the rest of the family when the Parks open and have a leisurely stroll about, taking in the sights and soaking up the atmosphere. Then it'll be lunch and nap time, then back to the Parks for some rides. We've got a short list of rides and attractions we'd like to do, but none of them are must-do's. We'll be happy exploring and letting Tink stop and play where she wants to. No doubt I'll be spending my hard saved Euros like they're going out of fashion along the way, I know a certain one year old in NC will be getting her belated birthday present from DLP this year! I'm excited to find some new souvenirs to go with my Disney collections and top of the list are some coffee mugs and Christmas decorations. I'll also be getting a couple of pins to go with my growing hoard and hope to get a nice one to commemorate Tinks first visit too and first ride and/or attraction. Then it'll be something quick and easy for dinner (I vote Earl of Sandwich yummy) before heading back to the room. There are night time shows and fireworks at DLP like at WDW but as we are only there for 2 nights and will hopefully be visiting annually now that we are Shareholders, I don't mind missing out on this in order that Tink has a rested night to enjoy as full a day as possible. And that'll be that! The trip is all paid for, spending money saved up. Clothing bought, washed, packed. Toiletries and travel essentials purchased or sought out from last year. Books and magazines purchased for any down time we might have (I'm taking my WDW planning guides haha). Let the countdown to DLP commence! In WDW news, when we get back from our trip to France it'll be about 2.5 months til our trip. By then the holiday itself will be paid for including the Park tickets and our extra special treat, Premium Class seats for the flight! More about that in my next installment though when I tell you all about DLP and what's next on the planning list for our first trip to FL with Tink. Thanks for sharing, Nine! Sounds like you have a wonderful trip planned. Now that you have everything ready, it's time to relax and have a wonderful trip! I'll be looking forward to your trip report. This sounds like such a fun trip. I'm sure you are going to have just as much fun catching up as you are being at Disney!